The chaos that followed the four-day closure of Nepal’s only international airport after a Turkish Airlines Airbus veered off the runway on 4 March only reconfirmed what everyone always knew – it is one of the worst airports in the world. The Turkish jet blocked the runway, closing the airport for all international flights, exposing many shortcomings: the lack of contingency planning, the unavailability of recovery equipment, the absence of information for stranded passengers, and a woefully inadequate infrastructure. Landing charges and ground handling fees in Kathmandu are among the top five in the world. Fuel cost here is up to three times more than that in Bangkok or Dubai. Add to that poor management and incompetence, and it’s a recipe for disaster. Even before the Turkish accident, incoming flights had to circle for hours because of poor visibility or lack of parking bays. Once the flights finally landed, ground handling was so inefficient it took three hours for luggage to arrive at malfunctioning carousels. Unable to handle flights smoothly even at the best of times, Kathmandu airport was incapable of servicing the 130 flights a day that started flying in and out from Saturday night. On normal days, there are only 80 international flights daily. There were chaotic scenes all week at the international terminal as airlines struggled to get angry passengers on flights out of Nepal. The airport was bursting at the seams, there was no centralised information system, hapless migrant workers and tourists looked lost. The 85-hour closure of the airport was another example of the lack of preparedness and equipment for removing aircraft disabled on the runway. The Civil Aviation Authority of Nepal manages the airport, ground-handling is done by Nepal Airlines, immigration is Home Ministry turf, customs is the Ministry of Commerce, and there has always been a lack of coordination between them. When a widebody jet blocked the runway, there was no one in charge, decisions were ad hoc and information sparse. Kathmandu is the country’s only international airport, and there is no other way in or out of Nepal by air. For tourism entrepreneur Ram Kaji Gurung, the chaos this week was nothing new. Earlier this year he had to wait four hours for his tour group to come out of the airport because the luggage took that long to arrive at the belt. There are 236 stakeholders and more than 60 unions at the airport, but there is little coordination between them. This leads to perennial problems like dirty departure halls, smelly toilets, inadequate trolleys, broken baggage belts, sluggish immigration, rubber-stamp security checks, and arbitrary customs procedures. Kathmandu’s new terminal and apron were designed three decades ago. In the last decade alone the annual passenger volume has grown three fold. A $92 million dollar expansion plan supported by the Asian Development Bank (ADB) for the terminals, taxiways, apron and runways has been plagued by delays. “The terminal building was just not designed to handle so much traffic. Passenger volume is ten times more than when it was built in 1990,” says Shrestha. There are just nine parking bays in the international apron, but only two can fit widebody jets. There are now 28 international airlines flying to Kathmandu, and more are coming. Nepal Airlines does ground handling for all of them except Thai and Air India, and it is so mismanaged that everything from check-in to baggage delivery is grossly inefficient and expensive. 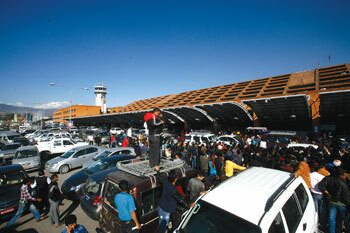 Kathmandu airport provides the first glimpse of Nepal to visitors, and a lasting impression when they leave. For now, it is not a very positive image. 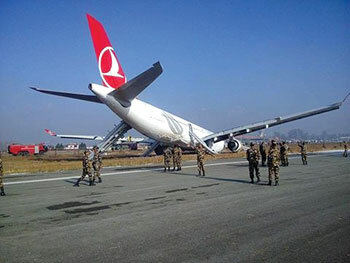 On Wednesday morning at 7:45 a Turkish Airlines Airbus had a near disaster while landing at Kathmandu Airport. But in blocking the only runway of Nepal’s only international airport, it visited a real and bigger disaster on the country. 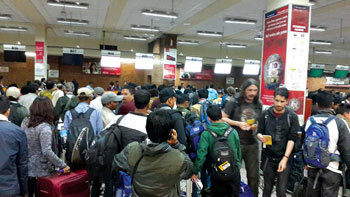 The airport was closed for four days for all international and some domestic operations, more than 80,000 people were stranded in Kathmandu and inbound airports. For a country so dependent on tourism and labour migration, the loss to the economy was colossal. A technical team from India managed to raise the plane with inflatable bags and tow it away. But relief of re opening the runway on Saturday night gave way to dismay as the airport authorities seemed incapable of handling the pressure of back-logged flights. The airport was open 24 hours, but as airlines brought in multiple widebody shuttles to fly stranded passengers in and out, the airport became a disaster zone. Flights circled for hours, waited in the taxiway for another hour just for a parking slot. The check-in area had standing room only, the security checks were VOR overwhelmed by lines. The real cost of the accident and its aftermath was to the country’s economy. No one has yet estimated the cumulative losses, but airlines alone suffered an estimated $80 million dollars in loss. Hardships for individual passengers, especially migrant workers, was staggering. A major international conference on hydropower was cancelled, trekking trips were scrubbed, and many international marriages postponed. 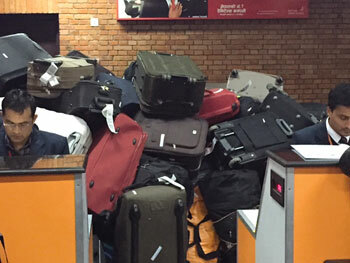 In the short-term, there are management issues that need to address ground handling delays, repairs to baggage carousels and streamlining passenger flow. In the medium-term Kathmandu airport’s $92 million dollar upgrade needs to be expedited. Then there are the longer-term issues of expediting alternate airports. Bhairawa and Pokhara expansions are two and three years from completion, and will take the pressure off Kathmandu somewhat. But Nijgad airport is an unrealistic political white elephant for now. 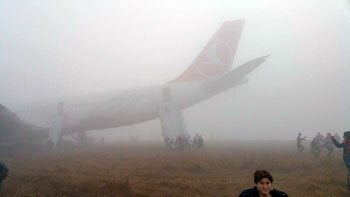 The Turkish Airlines accident could have been catastrophic, and the runway was re-opened with much improvisation. But the crisis at Kathmandu airport is far from over. The Turkish 726 Airbus 330-300 aircraft had been flying all night from Istanbul with 224 passengers and 11 crew on 3-4 March. The airline had just trained its pilots to carry out the RNP-AR (Required Navigation Performance- Authorisation Required) approach in Kathmandu, which is a more precise satellite GPS-based landing compared to the steeper VOR DME landings. Qatar, Korean and Druk also use this approach, which allows jets to land at under 1,000m visibility, compared to 3,000m earlier. On 4 March, visibility in the early morning was at below minimum and 726 circled over Simara for an hour before making an approach, but had to pull up at the last moment. “Runway not visible at decision height,” the captain told Kathmandu Air Traffic Control when asked about the reason for the go-around. The plane carried out a standard missed approach procedure, turning west and climbing to 10,500ft and then 20 miles south of the airport. By this time, the crew must have been calculating how much fuel it still had on board, and needed enough for a diversion to Dhaka. The captain opted for an immediate second try. Tower reported visibility at 3,000m but added casually: “Visibility at 1,000m southeast of the runway.” By the time the plane was at 5,600ft and 3 miles out a patch of fog suddenly moved in over the threshold. For some reason, despite poor visibility the pilots decided to go ahead and land. Passenger accounts speak of an extremely hard landing “20 times more violent than normal”. The plane veered off the runway to the left, the nose gear collapsed and the Airbus 330 came to rest between taxiways D and E. The grass was soggy due to the last two days of rain, and probably saved the plane from careening across the apron towards the terminal building. Photographs and videos of people coming down the evacuation slides that morning show fog so thick that it is hard to see the plane’s tail. Why the pilot decided to go through with the landing, and why the ATC did not warn of the fog patch are questions that will need to be answered.